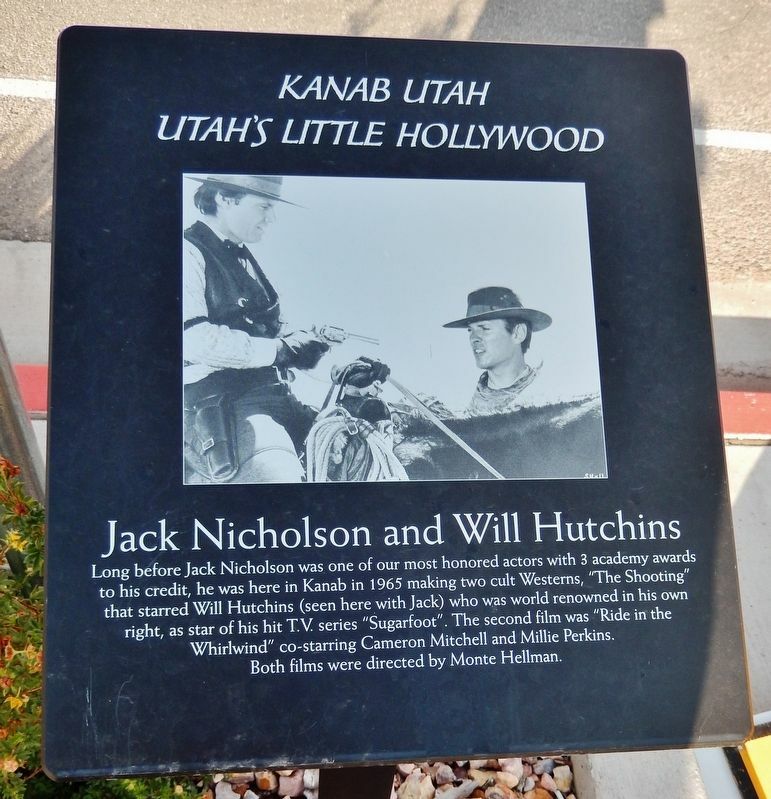 Long before Jack Nicholson was one of our most honored actors with 3 academy awards to his credit, he was here in Kanab in 1965 making two cult Westerns, "The Shooting" that starred Will Hutchins (seen here with Jack) who was world renowned in his own right, as star of his hit T.V. series "Sugarfoot". 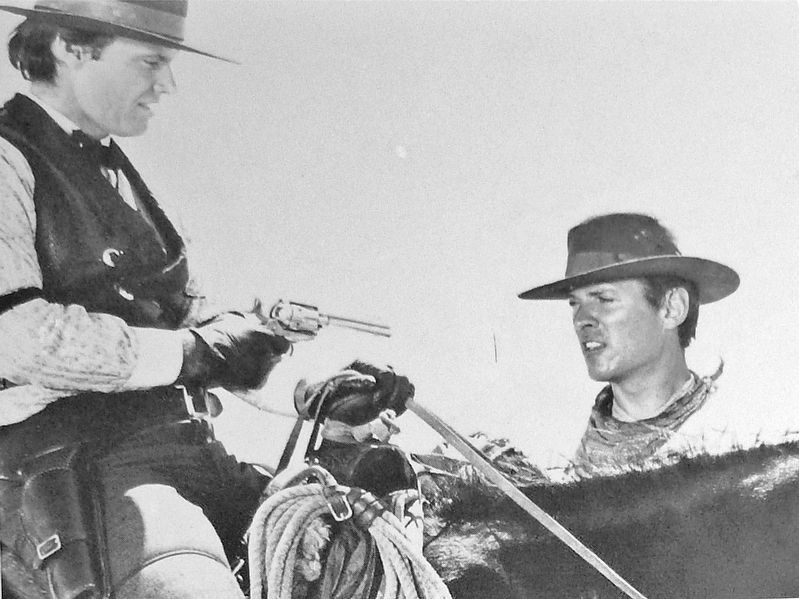 The second film was "Ride in the Whirlwind" co-starring Cameron Mitchell and Millie Perkins. Both films were directed by Monte Hellman. Location. 37° 2.629′ N, 112° 31.591′ W. Marker is in Kanab, Utah, in Kane County. Marker is on South 100 East (U.S. 89) south of East 200 South, on the right when traveling south. Touch for map. Marker is located beside the sidewalk, on the west side of the street, in front of a large grocery store parking lot. 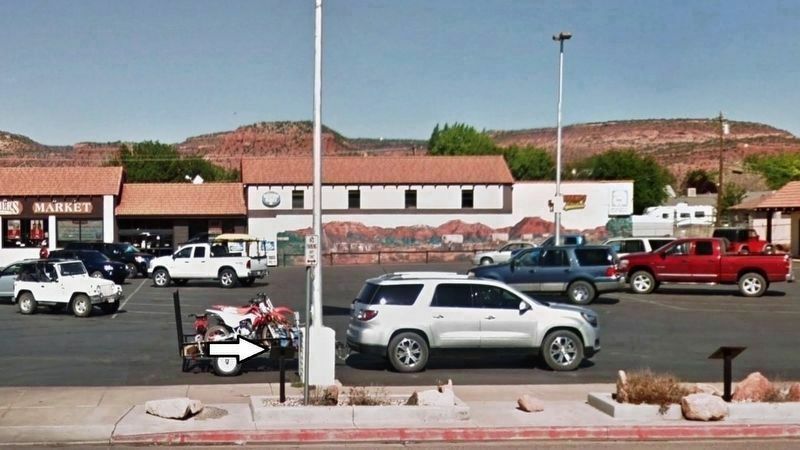 Marker is at or near this postal address: 264 South 100 East, Kanab UT 84741, United States of America. Touch for directions. (within shouting distance of this marker); Ava Gardner & Howard Keel (within shouting distance of this marker); Forrest Tucker (within shouting distance of this marker); Rod Cameron (within shouting distance of this marker); Peter Ford (within shouting distance of this marker); Gregory Peck (within shouting distance of this marker). Touch for a list and map of all markers in Kanab. More. Search the internet for Jack Nicholson and Will Hutchins. Credits. This page was last revised on March 7, 2019. This page originally submitted on March 6, 2019, by Cosmos Mariner of Cape Canaveral, Florida. This page has been viewed 27 times since then. Photos: 1, 2, 3. submitted on March 6, 2019, by Cosmos Mariner of Cape Canaveral, Florida. • Andrew Ruppenstein was the editor who published this page.